Decisions. People debate whether you 'take' or 'make' decisions. I care little about that. 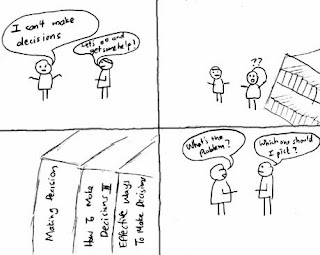 What interests me more are 'decisions' - what makes us take them, why we take them and under what circumstances. So many times, we are faced with a dilemma - we can go either this way or that. And we will never completely know which one will ultimately be the right one for us. We only know if we make a choice and take the plunge. Time will then tell. Eventually, you may prove to be right with what you decided or if luck's not in your favour, you may end up not being happy with the decision you made. In a situation like that we may think, why didn't we choose the other path? But hey it's always easy to say 'what if'. Regrets come to us very easily. But I repeat unless, you live your decision you will never completely know. So why ponder over what could have been when all we have with us is where we are now. It's a constant battle. We just have to learn to be comfortable with what we are, where we are and respect how we got here. I truly believe, we are where we are because of the combination of the decisions we make and luck. Yes, luck. Sometimes, there's so much negativity around you, you really need to silo yourself and muster up the courage to say you know why you made that decision and why you're here. You did it for yourself, now live out the consequences. Focus on the good. There is always an opportunity cost to every decision we make (or take, if you will). This is something we need to accept. Period. There's pros and cons, yin and yang to every darn thing. That's life. We get what we deserve. A wise friend once told me, ask only for how much you can handle. Nothing more, nothing less. His words have stayed with me. Now go on, live out your life...just because!